EOS (evolutionofsmooth.com) is a brand that I think bloggers are familiar with, especially those in the US. You are probably familiar with their sphere lip balms but did you know they make hand lotion? It is clear that packaging design is an important element to the brand. The pebble shape is fun and ergonomical, it fits nicely into the palm of your hand. This cream is light, absorbs quickly and does not leave behind a greasy residue. There are three fragrances and I chose Berry Blossom which is a pleasant fragrance. As the name suggests it is a fruity floral which is not overpowering but does gently linger. For me, the downside to this hand lotion is some of the ingredients - Water (Eau), Glycine Soja (Soybean) Oil, Cocoglycerides, Glyceryl Stearate, Dimethicone, Glycerin, Cetearyl Alcohol, Sodium Stearoyl Lactylate, Helianthus Annuus (Sunflower) Seed Oil, Butyrospermum Parkii (Shea Butter), Macadamia Ternifolia Seed Oil, Aloe Barbadensis Leaf Juice, Avena Sativa (Oat) Meal Extract, Tetrahexyldecyl Ascorbate, Tocopheryl Acetate, Retinyl Palmitate, Fragrance (Parfum), Carbomer, Methylchloroisothiazolinone, Methylisothiazolinone, DMDM Hydantoin, Sodium Hydroxide. Patent Pending. To quote EOS this cream is 97% natural formula, Paraben-free, Phthalate-free, Lanolin-free, Dye-free, Dermatologist tested, Hypoallergenic, not tested on animals and contains no animal by-products. I admit it was not until I experience mild irritation that I took a closer look at the ingredients. I doubt the fragrance is natural as "parfum" is listed with no explanation of the origin. I noticed that the lid logo indicates a 36 months open shelf life, this immediately triggers a concern that the product contains some serious preservatives. I have checked the EWG's database to find Methylchloroisothiazolinone and Methylisothiazolinone have been associated with allergic reactions. There were two other ingredients that I think are cause for concern. I will let you make up your own mind whether to buy this product. I do advise that if you have eczema on your hands be cautious and patch test (you should do this with all products). 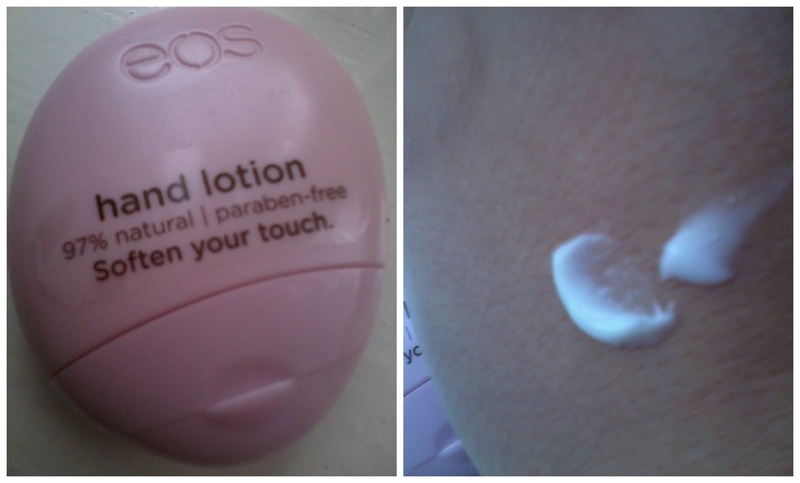 Despite my disappointment regarding the ingredients, this is a nice lotion and it does the job I want it to do. I brought this from cutecosmetics.co.uk and paid £7 for 44ml (anyone else think that is expensive?). In future I will continue to use Dr Organic (review link) and Tisserand (review link) hand creams. I was considering buying this lotion, I've seen so many reviews on and wanted to try it, but after seeing this review, maybe I won't! Thanks for the heads up about all the ingredients! the price is kind of high! and until you pointed out those ingredients i wouldn't have noticed (of course i would have taken a closer look if i had irritation like you, too) the perfume floral smell, isn't that the cause of irritation? i know i'm allergic to floral hand creams (i hate the smell anyway so i never go for floral types) but this could also be the cause. my hands flare up in utter redness and it itches like hell. the packaging is mega cute though and i probably would impulse buy this if it was in a store but because it's online purchase only i'd definitely shy away from the ridiculous price tag! i'm very glad that it's animal free ingredients and testing, too. it always is the main selling point to me. Thanks for your great comment. It is possible for the parfum to be an irritation but considering the preservatives it is not easy to pin point the cause. Sorry to hear about your own skin problems, that's interesting that you have to avoid florals.